As human beings, we’re not perfect and know that being forgetful can happen to the best of us. In fact, July 2nd is declared as “I forgot” day! If you are one that finds yourself forgetting to brush your teeth, you may be asking, “How often should I brush my teeth?”. Let’s start here. The American Dental Association® recommends brushing your teeth twice a day, flossing and rinsing with alcohol-free mouthwash once a day, and chewing sugar free gum between meals in order to reduce the build up of bacteria that can lead to cavities and gum disease. Your dentist agrees with this. In addition, you should let a professional “brush your teeth” at least twice a year. In other words, makes sure you are seen in a dental office at least twice a year for x-rays, cleanings and for preventative care, and as needed if you have pain or any dental or oral concerns. A healthy mouth is created from lifelong habits in good oral care, but, what if you forget? I Forgot To Brush My Teeth! If you forget to brush your teeth sometimes, you are not alone. We all forget things. If you do forget to brush your teeth, do it as soon as you think of it. If it becomes a habit, sadly, your teeth and gums will suffer. Often it is children who lament their forgotten habit, but it can be a problem for adults too. 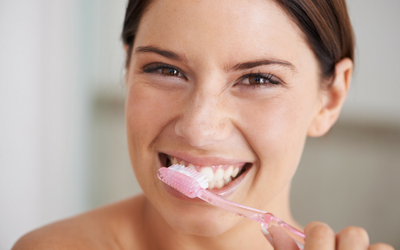 Here are some tips to help you remember and keep your oral care a priority. Task it. Make it part of your every day grooming routine to brush your teeth. Wake up, use the bathroom, brush your teeth, shower. When it becomes part of a routine, it is easier to remember. Set a timer. Use your phone, computer or even a friend to remind you when it is time to brush your teeth. Usually in the morning and evening make the most sense, but maybe with your schedule you need it to be right after breakfast and right before bed. Whenever you determine is the best time to brush, alert yourself and do it. Remind yourself. There is a saying: “out of sight, out of mind”. Help yourself remember by setting out your toothbrush or even posting a note somewhere you are sure to see it. Keeping it top of mind will help you integrate it into your everyday habits. Substitute sometimes. Carry sugar free gum and/or a sample size mouthwash with you in your bag or purse. When you can’t brush your teeth, take some time for a quick swish of mouth wash or pop some gum in your mouth. This is not a true substitute for tooth brushing, since it does not remove plaque, but it can help. Short answer: At least twice a day. And when you forget, do it when you remember. Talk to your dentist about other strategies to put in place to help stay on top of your brushing. At Krimsky Dental we are dedicated to helping more people have a healthy smile, which starts with your own daily oral care routine. Whether you need help for yourself or someone you love, Krimsky Dental is here. Find a dentist in your area online or call 954-584-6842 to make an appointment today!